A great example of a classic piece of English arts and crafts furniture. 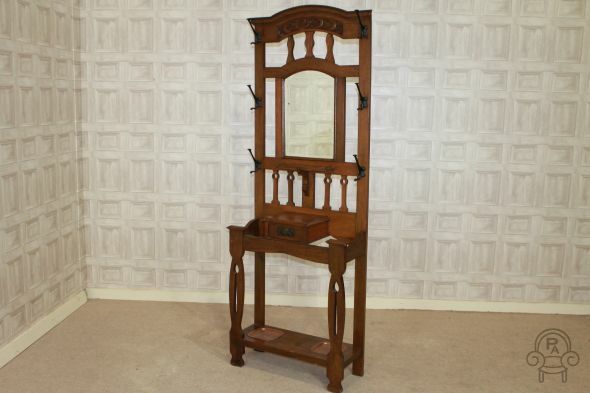 This elegant hall stand is made from solid English oak and has arts and crafts influenced carving and styling. This piece would stand beautifully in any period property, and features a bevel edged mirror to centre which is flanked by an array of cast iron hooks. This is positioned above a single drawer with stick stands to either side. The item is in good condition for its age, with a small amount of foxing to the mirror. As we have pointed out in the photos provided, there is a small amount of decorative moulding missing, but this does not detract from the overall appearance of this stunning hall stand. Please note: if you are not happy with the delivery cost quoted, you are more than welcome to arrange your own delivery or collection. Please be aware that our items are unfortunately not insured with any other courier service that you arrange and use.